Leah Hosler was born circa 1826 at York, Pennsylvania. She was the daughter of George Bortner Hosler and Maria Catharina Rohrbach. Name Variation George Rohrbach Hosler was also known as G. R.
George Rohrbach Hosler was born on 3 October 1834 at Morrow, Ohio. He was the son of George Bortner Hosler and Maria Catharina Rohrbach. George Rohrbach Hosler married Elizabeth Shell, daughter of Christian Shell and Margaret Weaver, in 1854. George Rohrbach Hosler died after 1880. [S248] U.S. Federal Census 1860 U.S. Federal Census, by Ancestry.com, Year: 1860; Census Place: Perry, Morrow, Ohio; Roll M653_1017; Page: 239; Image: 481; Family History Library Film: 805017. Henry Rohrbach Hosler was born in 1817. Henry Rohrbach Hosler died on 17 February 1887 at Noble, Noble, Indiana. Married Name before 1860 As of before 1860,her married name was Hood. Mary Ann Seiders was born on 24 January 1840 at Lebanon, Richland, Ohio, also reported as 24 Jan 1839. Mary Ann Seiders married Sergeant Joseph M. Hood, son of Samuel Blair Hood and Sarah Jane Miller, before 1860. Mary Ann Seiders was listed as a beneficiary in Catherine Elizabeth Kiefer's will on 18 April 1904 at Sauk, Wisconsin. Mary Ann Seiders died on 8 October 1922 at age 82 Mary (Seiders) Hood obituary. 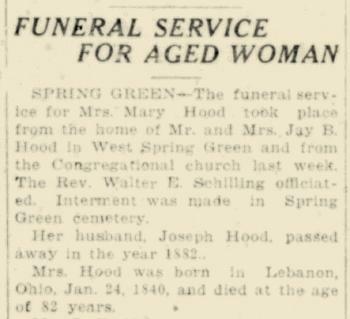 She was buried after 8 October 1922 at Spring Green Cemetery, Spring Green, Sauk, Wisconsin. 1 June 1905 Spring Green, Sauk, Wisconsin She appeared on the census of 1 June 1905 at Spring Green, Sauk, Wisconsin. Mary Ann Seiders had 11 with 7 living in 1900 children. Name Variation Eliza Ann Seiders was also known as Elizabeth. Name Variation Eliza Ann Seiders was also known as Liza. Name Variation Eliza Ann Seiders was also known as Lizzie. Married Name before August 1860 As of before August 1860,her married name was Hood. Eliza Ann Seiders was born on 9 March 1842 at Richland, Ohio. Eliza Ann Seiders married Captain Thomas R. Hood, son of Moses Hood and Sarah Russel, before August 1860. Eliza Ann Seiders married Lemuel Winston Hood, son of Samuel Blair Hood and Sarah Jane Miller, circa 1872. Eliza Ann Seiders was listed as a beneficiary in Catherine Elizabeth Kiefer's will on 18 April 1904 at Sauk, Wisconsin. 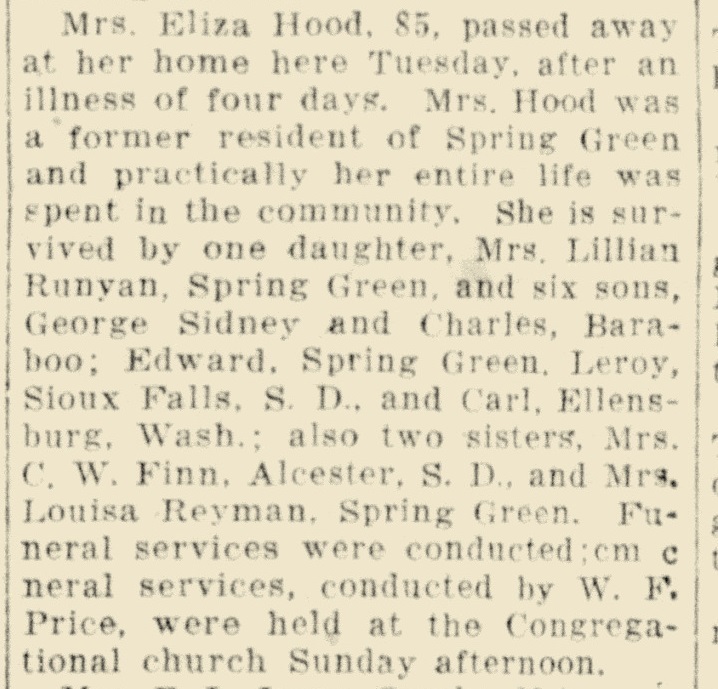 Eliza Ann Seiders died on 30 May 1927 at age 85 Eliza (Seiders) Hood obituary. 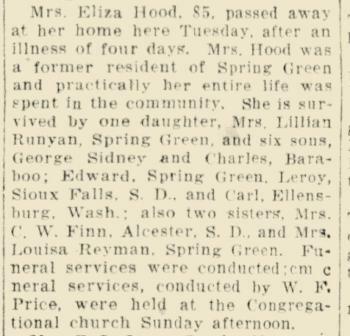 Eliza Ann Seiders had 7 with 7 living in 1910 children. [S248] U.S. Federal Census 1860 U.S. Federal Census, by Ancestry.com, Page 126. Dwelling 958. [S247] U.S. Federal Census 1870 U.S. Federal Census, by Ancestry.com, Page 11. Dwelling 73. Name Variation Philip Jacob Seiders was also known as Siders. Name Variation Philip Jacob Seiders was also known as P. J. Name Variation Philip Jacob Seiders was also known as Jacob. Philip Jacob Seiders was born on 15 October 1837 at Richland, Ohio. Philip Jacob Seiders married Clarissa R. Elwood, daughter of Reverand H. R. Elwood, on 21 July 1861 at Sauk, Wisconsin. Philip Jacob Seiders was listed as a beneficiary in Catherine Elizabeth Kiefer's will on 18 April 1904 at Sauk, Wisconsin. 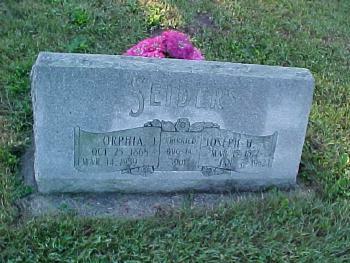 Philip Jacob Seiders died on 13 September 1913 at age 75. [S247] U.S. Federal Census 1870 U.S. Federal Census, by Ancestry.com, Page 10. Dwelling 70. [S245] U.S. Federal Census 1900 U.S. Federal Census, by Ancestry.com, ED145. Dwelling 45. [S244] U.S. Federal Census 1910 U.S. Federal Census, by Ancestry.com, Year: 1910; Census Place: Spring Green, Sauk, Wisconsin; Roll T624_1737; Page: 9B; Enumeration District: 126; Image: 47. Name Variation Clarissa R. Elwood was also known as Clara R.
Name Variation Clarissa R. Elwood was also known as Ellwood. Married Name 21 July 1861 As of 21 July 1861,her married name was Seiders. Clarissa R. Elwood was born in 1844 at Sauk, Wisconsin, also reported as Ohio. She was the daughter of Reverand H. R. Elwood. Clarissa R. Elwood married Philip Jacob Seiders, son of Joseph Seiders and Catherine Elizabeth Kiefer, on 21 July 1861 at Sauk, Wisconsin. Clarissa R. Elwood died on 21 January 1899 at Sauk, Wisconsin. 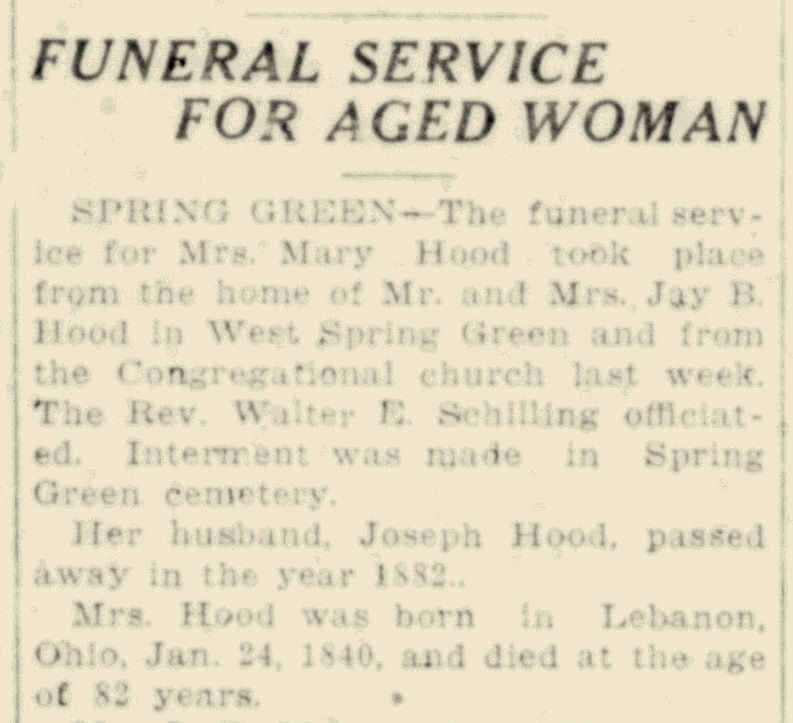 She was buried after 21 January 1899 at Spring Green Cemetery, Spring Green, Sauk, Wisconsin. Name Variation William Edward Seiders was also known as W. E.
William Edward Seiders was born in 1865 at Sauk, Wisconsin. He was the son of Philip Jacob Seiders and Clarissa R. Elwood. William Edward Seiders married Augusta Goodwin circa 1893. William Edward Seiders and Augusta Goodwin were divorced before 1930. 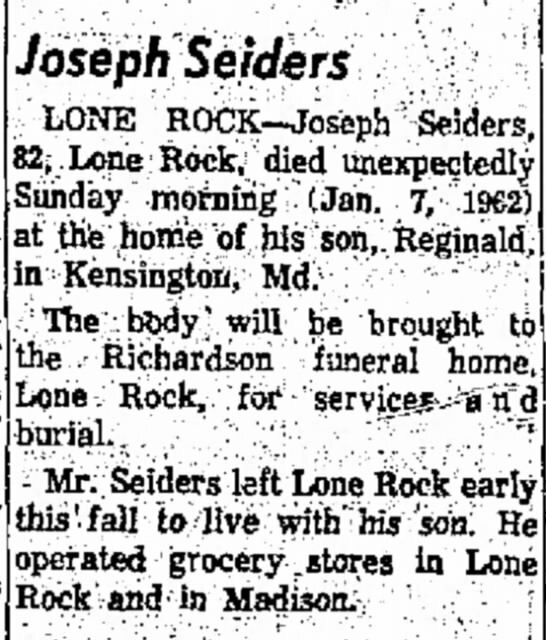 William Edward Seiders died on 5 February 1940 at Wisconsin William E Seiders obituary. He was buried after 5 February 1940 at Spring Green Cemetery, Spring Green, Sauk, Wisconsin. 1 June 1905 Spring Green, Sauk, Wisconsin William Edward Seiders is listed as son on the census of 1 June 1905 in the household of Philip Jacob Seiders at Spring Green, Sauk, Wisconsin. 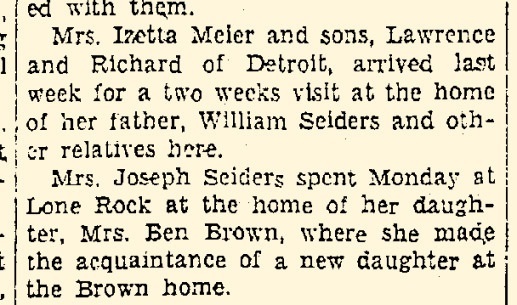 In July 1930 Mrs. Izetta Meier and sons, Lawrence and Richard of Detroit, arrived last week for a two week visit at the home of her father, William Seiders and other relatives here. [S243] U.S. Federal Census 1920 U.S. Federal Census, by Ancestry.com, Year: 1920; Census Place: Spring Green, Sauk, Wisconsin; Roll: T625_2015; Page: 13B; Enumeration District: 178; Image: 473. Name Variation Reverand H. R. Elwood was also known as Ellwood. Reverand H. R. Elwood was born in 1810 at New York. Married Name 4 March 1876 As of 4 March 1876,her married name was Seiders. Susan Dillon married William Hamby Seiders, son of Joseph Seiders and Catherine Elizabeth Kiefer, on 4 March 1876 at Iowa, Wisconsin. Susan Dillon died before 1880 son Joseph H Seiders living with paternal grandparents in June 1880 census. He was the son of William Hamby Seiders and Susan Dillon. Joseph Harry Seiders married Orphia Jane Culver, daughter of Alvah L. Culver Jr. and Mary Jane Loyd, on 14 August 1901 at 2nd marriage for her. 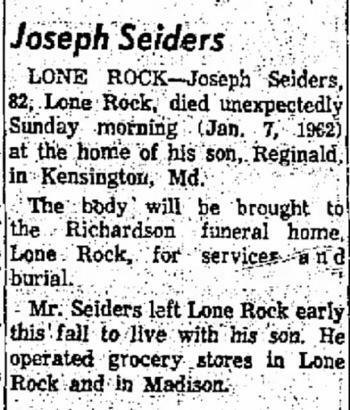 Joseph Harry Seiders died on 7 January 1962 at at the home of his son Reginald, Kensington, Maryland, at age 84 Joseph Seiders obituary. 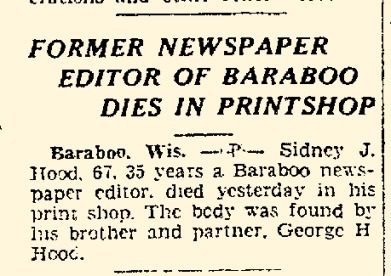 He was buried after 7 January 1962 at Spring Green Cemetery, Spring Green, Sauk, Wisconsin. 1 June 1905 Spring Green, Sauk, Wisconsin Joseph Harry Seiders appeared on the census of 1 June 1905 in the household of William Hamby Seiders at Spring Green, Sauk, Wisconsin. Joseph Harry Seiders and Orphia Jane Culver lived on 1 April 1935 at Madison, Dane, Wisconsin. Joseph Harry Seiders was educated in 1940 at through 8th grade. [S6] Wisconsin, Wisconsin Vital Record to 1907, Reel 0263 Record 001475. [S373] U.S. Federal Census 1940 U.S. Federal Census, by Ancestry.com, ED56-37. Sheet 2a. Dwelling 23. Name Variation Orphia Jane Culver was also known as Orphi J. Name Variation Orphia Jane Culver was also known as Orpha J. Married Name before 1892 As of before 1892,her married name was McKensie. Married Name before 1892 As of before 1892,her married name was McKenzie. Married Name 14 August 1901 As of 14 August 1901,her married name was Seiders. Orphia Jane Culver was born on 25 October 1868 at Wisconsin. She was the daughter of Alvah L. Culver Jr. and Mary Jane Loyd. Orphia Jane Culver married John Frank McKensie before 1892. Orphia Jane Culver married Joseph Harry Seiders, son of William Hamby Seiders and Susan Dillon, on 14 August 1901 at 2nd marriage for her. Orphia Jane Culver died on 14 March 1959 at hospital, Richland Center, Richland, Wisconsin, at age 90 Orphia (Culver) McKenzie Seiders. 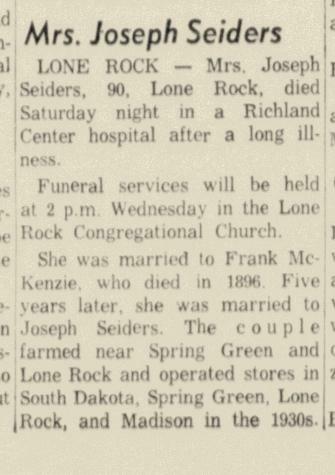 She was buried after 14 March 1959 at Spring Green Cemetery, Spring Green, Sauk, Wisconsin. 1 June 1905 Spring Green, Sauk, Wisconsin Orphia Jane Culver appeared on the census of 1 June 1905 in the household of William Hamby Seiders at Spring Green, Sauk, Wisconsin. Orphia Jane Culver had 4 with 2 living in 1900 children. She had 3 with 3 living in 1910 children. 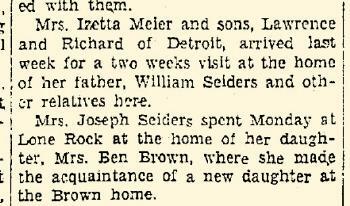 In July 1930 Mrs Joseph Seiders (Orphia Culver) visited Ben Brown home and new granddaughter. 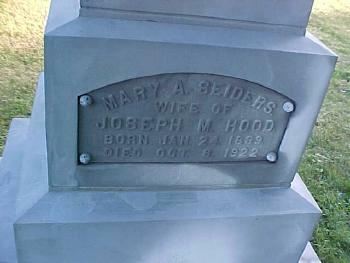 She and Joseph Harry Seiders lived on 1 April 1935 at Madison, Dane, Wisconsin. Orphia Jane Culver was educated in 1940 at through 8th grade. Ivan Earl Farington was born on 9 December 1868 at Spring Green, Sauk, Wisconsin. He was the son of Charles William Farington and Mary Abigail Kiefer. Ivan Earl Farington died on 1 December 1899 at Falls City, Richardson, Nebraska, at age 30. 2 June 1885 Midway Borough, Falls City, Richardson, Nebraska Ivan Earl Farington appeared on the census of 2 June 1885 in the household of Charles William Farington at Midway Borough, Falls City, Richardson, Nebraska. Name Variation Fred Ernest Farington was also known as F. E.
Fred Ernest Farington was born on 23 March 1870 at Spring Green, Sauk, Wisconsin. Fred Ernest Farington married Frances M. Maddox on 31 December 1905 at Falls City, Richardson, Nebraska. Fred Ernest Farington died on 29 July 1943 at Falls City, Richardson, Nebraska, at age 73. 2 June 1885 Midway Borough, Falls City, Richardson, Nebraska Fred Ernest Farington appeared on the census of 2 June 1885 in the household of Charles William Farington at Midway Borough, Falls City, Richardson, Nebraska. Married Name 9 December 1897 As of 9 December 1897,her married name was Towle. Lillian May Farington was born on 2 November 1871 at Spring Green, Sauk, Wisconsin. She was the daughter of Charles William Farington and Mary Abigail Kiefer. Lillian May Farington married Edwin Herman Towle on 9 December 1897 at Falls City, Richardson, Nebraska. Lillian May Farington died on 29 July 1943 at Falls City, Richardson, Nebraska, at age 71. 2 June 1885 Midway Borough, Falls City, Richardson, Nebraska Lillian May Farington appeared on the census of 2 June 1885 in the household of Charles William Farington at Midway Borough, Falls City, Richardson, Nebraska. Name Variation Edwin Herman Towle was also known as E. H.
Edwin Herman Towle married Lillian May Farington, daughter of Charles William Farington and Mary Abigail Kiefer, on 9 December 1897 at Falls City, Richardson, Nebraska. Estella Bell Farington was born on 4 November 1873 at Marshall, Kansas. Estella Bell Farington died on 10 November 1883 at Falls City, Richardson, Nebraska, at age 10. Married Name 31 December 1905 As of 31 December 1905,her married name was Farington. Frances M. Maddox was born on 22 October 1877 at Richardson, Nebraska. She married Fred Ernest Farington, son of Charles William Farington and Mary Abigail Kiefer, on 31 December 1905 at Falls City, Richardson, Nebraska. 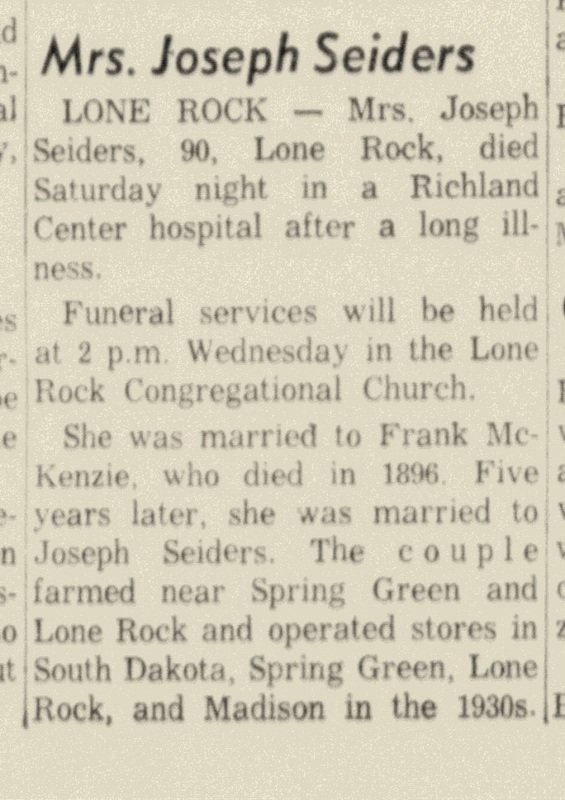 Frances M. Maddox died on 27 March 1937 at Richardson, Nebraska, at age 59. Calvin Hays was born circa 1829. He was the son of Calvin W. Hays and Adeline Olmstead. Calvin Hays died before 1921. William Hays was born in 1845 at Masonville, Delaware, New York. William Hays died before 1850. Walter Benjamin Hays was born on 4 January 1842 at Masonville, Delaware, New York, tombstone reported birth as 4 Jan 1843. Walter Benjamin Hays married Sarah J. (?) before June 1880. Walter Benjamin Hays died on 1 February 1895 at age 53. [S180] Wisconsin Sauk Co Cemetery Records Vol 6, page 102. [S248] U.S. Federal Census 1860 U.S. Federal Census, by Ancestry.com, Page 122. Dwelling 925. Helen E. Hays was born on 24 April 1830 at Greene, New York. Clark D. Hays was born on 20 September 1840 at Poughkeepsie, Dutchess, New York. Clark D. Hays died before 1850. Clarence W. Hays was born on 29 November 1832 at Greene, New York. Clarence W. Hays died before 1921. Name Variation Johannes Jacob Seiders was also known as Jacob. Name Variation Johannes Jacob Seiders was also known as Seider. Johannes Jacob Seiders was born on 16 December 1778 at Pennsylvania. He married Margaretha Krick, daughter of George Krick and Margaret Seitzinger, on 2 October 1803 at Pennsylvania. Johannes Jacob Seiders died on 9 October 1869 at age 90. Married Name 2 October 1803 As of 2 October 1803,her married name was Seiders. Margaretha Krick was born on 24 July 1781 at Berks, Pennsylvania. She was the daughter of George Krick and Margaret Seitzinger. Margaretha Krick married Johannes Jacob Seiders on 2 October 1803 at Pennsylvania. Margaretha Krick died on 28 October 1864 at age 83. Name Variation Captain Thomas R. Hood was also known as T. R.
Captain Thomas R. Hood was born on 15 January 1836 at Pennsylvania. He was the son of Moses Hood and Sarah Russel. Captain Thomas R. Hood married Eliza Ann Seiders, daughter of Joseph Seiders and Catherine Elizabeth Kiefer, before August 1860. Captain Thomas R. Hood died on 30 April 1867 at age 31 31y 3m 15d. Captain Thomas R. Hood was a carpenter in 1860. 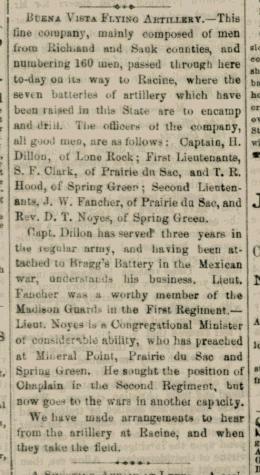 In September 1861 at Madison, Dane, Wisconsin, Buena Vista Flying Artillery on its way to Racine passes through town including company officer T R Hood. [S249] U.S. Federal Census 1850 U.S. Federal Census, by Ancestry.com, Stamp 57. Dwelling 104. Moses Hood was born in 1804 at Pennsylvania. He married Sarah Russel before 1834. Moses Hood married Isabelle (?) before 1870. Moses Hood died on 6 October 1885. 1855 Spring Green, Sauk, Wisconsin He appeared on the census of 1855 at Spring Green, Sauk, Wisconsin. 1885 Dresden, Chickasaw, Iowa He appeared on the census of 1885 at Dresden, Chickasaw, Iowa. [S247] U.S. Federal Census 1870 U.S. Federal Census, by Ancestry.com, Year: 1870; Census Place: Spring Green, Sauk, Wisconsin; Roll: M593_1739; Page: 234B; Image: 157048; Family History Library Film: 553238. [S246] U.S. Federal Census 1880 U.S. Federal Census, by Ancestry.com, Year: 1880; Census Place: Dresden, Chickasaw, Iowa; Roll: 332; Family History Film: 1254332; Page: 402D; Enumeration District: 188; Image: 0407. Name Variation Sarah Russel was also known as Russell. Married Name before 1834 As of before 1834,her married name was Hood. Sarah Russel was born circa 1806 at Pennsylvania. She married Moses Hood before 1834. Sarah Russel died after 1850 at Wisconsin. Sidney J. Hood was born on 10 October 1864 at Spring Green, Sauk, Wisconsin. He was the son of Captain Thomas R. Hood and Eliza Ann Seiders. Sidney J. Hood married Edith Watson, daughter of William Watson, circa 1901. Sidney J. Hood died on 1 February 1932 at age 67 Sidney J Hood death notice. In 1892 Sidney J. Hood, of the firm of Allard & Hood, publishers and editors of The Evening Star and The Star of the West of Beardstown, was born in Spring Green, Sauk county, Wisconsin, October 10, 1864. He was reared and educated at that place and acquired a knowledge of carpenter and mason trades, but later went into the newspaper business. His father, Captain Thomas R. Hood, came from Pennsylvania to Wisconsin when a small child with his parents, Moses and Sarah Hood, natives of Pennsylvania, but who died in Wisconsin. Thomas R. Hood grew up as a farmer and carpenter, and when the war broke out he enlisted in the Sixth Wisconsin Regiment Light Artillery as a volunteer and served three and one half years, and was honorably discharged as Captain of his company. 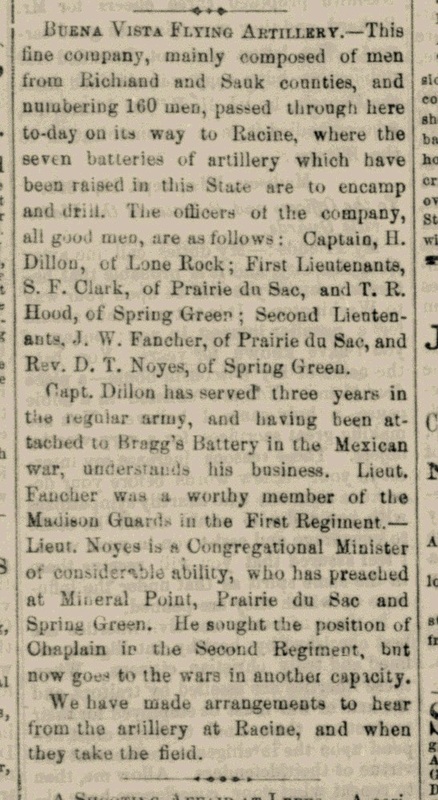 He had led his men through the battles of Corinth, Shiloh and other active engagements, and was much beloved by the members of his company. He had married Eliza A. Seiders, daughter of Joseph and Elizabeth (Keifer) Selders. 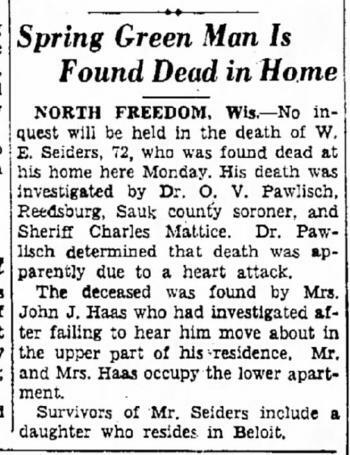 They had come West at a very early day, settling in Sauk county on Government land, and the same on which Joseph Seiders and wife lived and where Mr. Seiders died, a very old man, in the spring of 1888. His wife, who is yet living, at the age of eighty, is yet very active and interested in her surroundings. She and her husband were members of the United Brethren Church. Our subject is the second of three children, and since his thirteenth year he has supported himself. At the age of seventeen years he began work at his native home at Spring Green on a paper known as the Weekly Home News. He has always regarded these early days in Spring Green as the palmy days of his life as well as of his newspaper work. In 1889 he came to Arenzville, Cass county, Illinois, and started the Arenzville Argus, and at the same time the Chapin Boomerang, and ran the papers for about sixteen months, when he sold out and came to Beardstown, where he has since lived. For some time, also, he was a worker on the Laramie (Wyoming) Sentinel, Bill Nye's old "first love." The first issue of the Daily Star took place March 7, 1892; present firm was started February 24, 1892. Both the daily and weekly papers are very prosperous. Mr. Hood is a very energetic man, and being a practical printer understands thoroughly the management of a newspaper. Mr. Hood is still unmarried. He is an ardent Republican. [S245] U.S. Federal Census 1900 U.S. Federal Census, by Ancestry.com, ED126. Dwelling 522. [S244] U.S. Federal Census 1910 U.S. Federal Census, by Ancestry.com, ED105. Dwelling 81. [S243] U.S. Federal Census 1920 U.S. Federal Census, by Ancestry.com, ED153. Dwelling 112.